Found one file extension association related to Zoner Draw and 1 file format developed specifically for use with Zoner Draw. Zoner Draw is the ideal tool for creating pictures, calendars, birthday cards, flyers, illustrated documents, stationery and envelopes with your personally-designed letterhead, holiday greeting cards, business cards, and so much more. Zoner Draw is easy to use and ensures professional-looking results. A broad range of options for printing is supported, including dynamically generated documents and calendars. You can even export to PDFformat. The built-in picture editor supports new bitmap formats (such as PSP, PSD and RAW) and even has Photoshop filter support. An assortment of bitmap and vector clip art images is available in the clip art gallery. A wide range of tools for drawing even the most complex of illustrations, documents, and other graphics is available to help you achieve truly professional results. Zoner Draw 5 brings you every illustration and desktop publishing (DTP) tool you’d expect from a professional program: shape, line and curve drawing, shaping, and editing tools, clip art, as well as tables and text. Zoner Draw also allows you to import from, and export to, all standard illustration formats. Zoner Draw has the tools you need to design and enhance your illustrations, logos, and presentation graphics. Create your own shapes, lines, and curves, from simple ones to the highly complex, or use the many available templates. Make your pictures stand out with the array a of object fills :from standard onesto the bold and exuberant, like fractal and shading patterns and six types of fountain fill settings. Zoner Draw offers customizable pen styles, object transparency, advanced text tools, boolean operations on objects, and other advanced vector graphics tools. 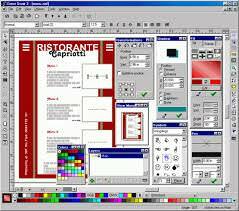 The popularity of Zoner Draw 5 for preparing a broad variety of Web graphics is quickly increasing. Your drawings can easily be exported to a bitmap format for use on the Web. The convenient preview pane allows you to set options such as anti-aliasing, JPEG compression, and more. Also important for web designers is the option of using pixels as the unit of measurement for your drawings. Graphics exported from Zoner Draw can also be "put into motion" using Zoner GIF Animator, which is included with every purchase of Zoner Draw 5 as a free bonus. Everything you need for creating floor plans, marketing diagrams, process flow diagrams, and more is here for you. Use guidelines, pen styles and a grid with customizable density for typical map and chart tasks, like duplication, and even spacing and sizing. Any export format you will likely need for presenting your work is here. Use the Billboard Printing fearure for printing in extra large formats. Zoner Draw includes a full-featured PDF maker. Perform powerful print jobs: create calendars, contact sheets, template-based prints, and take advantage of paper-saving prints options. Zoner Draw includes various print templates, including templates for Zoner Photo Studio. The Zoner Draw software seems to be old or discontinued. If you need more information please contact the developers of Zoner Draw (ZONER, Inc.), or check out their product website.